Anyone who knows how fast I can knit knows that this title is a bit absurd, but I thought it best to set a few goals for my knitting pursuits. I don't knit fast at all and I don't want to set any speed knitting records, but several experienced knitters have told me that my form could be improved. I have also learned from several reputable sources that I knit too far down the needle and I tend to "torture" my stitches. I haven't waterboarded them yet, but you never know with the ever devolving state of my Knitatorship. So, in an effort to introduce some consistency in my craft and the joy of a finished object, I proudly introduce FINISHED OBJECT FRIDAYS. We'll see if this a realistic goal, or if that extra shot in my Peet's soy latte has erased all of my ability to reason. At the moment, I have many, many things on needles (an EZ EPS raglan sweater, a knitty Nautiloid, a Melanie Falick brioche scarf, a Yarn Harlot pattern scarf, a Charlene Schurch turkish hat, 3 different pairs of socks) and I have lots of new yarns that are itching to be swatched, washed and measured. I recognize this virulent hybridized strain of OCD/Startitis but I am willing to entertain the antidote in the possibility of presenting some form of completed project every Friday. For my first entry, I present the latest pair of socks for my Sweetpea, Anto (who has size 13 feet, thank you very much). 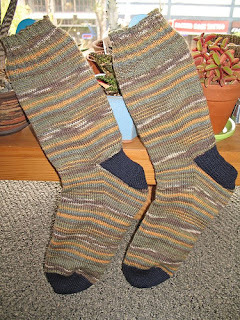 The pattern is the basic Ann Budd Handy Book of Patterns sock. It's got 2x2 ribbing at the top with a short-row heel and wedge toe. The main body of the sock is Trekking Pro Natura #1602 (yummy Superwash wool and bamboo) while the heel and toe are Knit Picks Essential(Superwash wool and nylon) in navy. I got the Pro Natura at Stitches West and I only got 2 skeins, since they were $18 each and I had the rent to pay. Amazingly, I found this killer dutch retailer who sells it for $10 a ball.... oh wait, that's another post. In any case, I really loved this yarn and I'll definitely be knitting some socks for myself. So, a lovely weekend to all of you. I intend to get a leg up on all my unfinished objects by getting something ready for next Friday. Wish me luck! Labels: knit socks trekking "finished objects"
Those are cool. Love the colors. And if you ever find yourself panicking on Thursday night because you don't have anything to show off on Friday, just knit some doll stuff for me. Oh, we'll working on many projects, Sir!! In fact, we need to reschedule our "big meeting" about your future. Ha ha. I feel like I'm being called into my high school counselor's office. I'm around whenever. Give me a call! I have no issues with your knitting perfection. Wow, super impressive. Just finishing two of the same socks is a major accomplishment in my book!